Information in the hands of public administrations plays a fundamental role in developing democracies and carrying out daily tasks—not only the public administrations’ tasks, but also those of the general public and companies (European Commission, 1998). New information and communications technologies (ICT) are vastly increasing the range of information in the hands of the general public and considerably diversifying both quantitatively and, above all, qualitatively the tools for conveying this, with the Internet being the means chosen by Organisation for Economic Co-Operation and Development (OECD) Member States to provide the general public with access to the information held by the administration (OECD, 2003). Nowadays, public administrations create, collect, develop and disseminate large amounts of information: business and economic information, environmental information, agricultural information, social information, legal information, scientific information, political information and social information. Access to information is the first step towards developing e-governments and is something that has grown most in recent years, not only from the viewpoint of supply but also of demand. 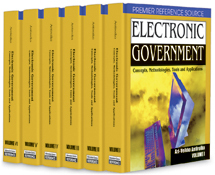 At present, most people using e-government do so to obtain information from public administrations. Throughout history, information has not always had the same relevance or legal acknowledgement in the West. Bureaucratic public administrations had no need to listen to the general public nor notify citizens of their actions. Hence, one of the bureaucratic administration’s features was withholding the secret that it had legitimized, since this was considered the way to maintain the traditional system of privileges within the bureaucratic institution—by making control and responsibility for information difficult, and also by allowing the public administration to free itself of exogenous obstacles (Arteche, 1984; Gentot, 1994). In most European countries, except the Nordic countries (Sweden, Norway, Finland), secrets were the dominant principle. For instance, it was not until 1978 that France passed a law concerning access to public sector information; in 1990, Italy did likewise. Crises in the bureaucratic model of public administration have brought with them the existence of new models. Receptivity, focusing on the client and quality management, have been some responses to the crisis of this model in the 1980s and 1990s, since the advent of the post-bureaucratic paradigm ( Mendieta, 1996; Behn, 1995). The process of modernizing Public administrations has meant that those governed have come to be considered clients of these administrative services (Brugué, Amorós, & Gomà, 1994). Citizens, considered as clients, now enjoy a revitalized status as seen from public administrations, which provides citizens with a wide range of rights and powers in order to carry out their needs, including obtaining information from the administration (Chevalier, 1988). This process has coincided over the years with the rules regulating access to public-sector information being extended in countries of the West. But the evolution does not stop here. Societies that are pluralist, complex and interdependent require new models of public administration that allow the possibility of responding and solving present challenges and risks (Kooiman, 1993; OECD, 2001b). Internet administration represents a model of public administration based on collaboration between the administration and the general public. It has brought about a model of administration that was once hierarchical to become one based on a network in which many links have been built between the different nodes or main active participants, all of whom represent interests that must be included in the scope of general interest due to the interdependence existing between them (Arena, 1996). The way the administration is governed online requires, first and foremost, information to be transparent, with the aim of guaranteeing and facilitating the participation of all those involved (European Commission, 2001). It is essential that all those involved in the online process are able to participate with as much information as possible available. Information is an indispensable resource for decision-making processes. The strategic participants taking part in these will consider the information as an element upon which they may base their participation online. Information becomes a resource of power that each participant may establish, based on other resources he or she has available, and this will influence their strategies in the Internet. This allows us to see that the networks distributing information may be asymmetrical, which leads to proposing a need to adopt a means to confront this asymmetrical information. In this task, ICT can be of great help with the necessary intervention of law. Public-sector information has an important role in relation with citizens’ rights and business. Public administration also needs information to achieve its goals.